Smoking adds flavor to meat and keeps it tender. Smoked meats may be purchased or made at home and are a staple of diets around the world. Despite its prevalence and taste, the health of smoked meats is controversial. You should understand the risks and benefits of smoked meats before you eat them. Smoking is a method of slow cooking using a smoker or covered grill. Some smoking methods preserve meats so they can be stored at room temperature. Cold smoking is a slower smoking process that uses a lower temperature and may require days to complete. 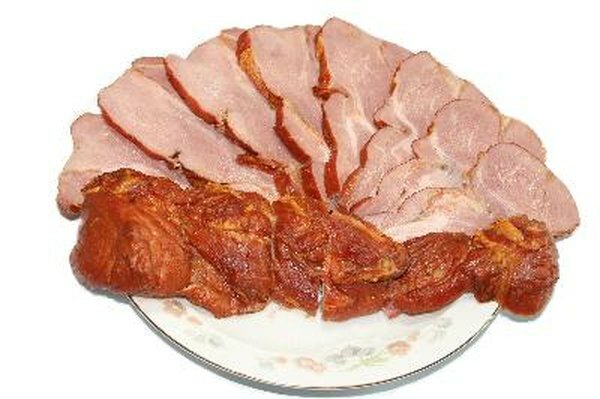 Smoked meats are usually heavily salted during preparation. High dietary intake of sodium increases your risk of developing high blood pressure and heart disease. Meats are rich in protein and some are rich in minerals like iron. Whether smoked meat is healthy relates directly to the type of meat. Lean meats like buffalo, venison, turkey, fish and chicken breast contain less fat than pork and beef. Some fishes are rich in omega-3 fatty acids, a healthy fat that promotes nervous system and cardiovascular health. As with any food, smoked meats are best consumed in moderation. Consuming more than 30 percent of your daily calories from fat may increase your risk of heart disease and stroke. Smoking, however, may allow the fat to drip off the meat and decrease its total fat content. Smoking meats produces carcinogens, substances that are linked to cancer. Researchers have shown the relationship between different types of cancer and ingestion of smoked foods. Avoid overheating your grill or smoker, as this may increase carcinogen content. Products smoked at home may have more carcinogens than industrially smoked products, possibly because industrial products have specific temperature controls. Your smoker should be made of materials that are approved for contact with meats and maintain integrity when heated. Using makeshift smokers may result in chemical contamination and illness. The U.S. Department of Agriculture advises that proper preparation is crucial for safe consumption of smoked meats. Meats should be thawed and marinated in the refrigerator before smoking. Use a thermometer to ensure that the smoker temperature stays between 225 and 300 degrees Fahrenheit. Pregnant women should avoid smoked meats in case they are contaminated with dangerous bacteria or parasites. Caution should be taken when cold-smoking fish because some fish contain parasites that won't be destroyed unless exposed to high temperatures.